Rolling out a new software product and want to get the word out to your target audience? Need to do a briefing on a new product or program? Have tips and best practices you want to share with customers and/or prospects and don’t know the most beneficial way to share this information with them? If you are looking to reach and interact with your customers and prospects in an effective and low-cost manner, webinars are a great way to reach that goal. However, planning a successful webinar can be intimidating and challenging for even an experienced marketing team. Marketers can certainly accelerate lead conversions using webinars, but without proper planning and a solid promotional strategy, the webinars that you have worked so hard to create will fall flat. It takes time and effort to plan a successful webinar. I highly recommend the planning process starts 8 weeks out from the day of the live webinar. From my experience with clients, the average webinar requires between 30 and 40 person-hours to plan, promote, deliver, and follow through. Here are 6 essential tips to get you started on your way to planning your company’s successful webinar event. In the first two weeks of your webinar planning process, it is critical that you develop a thorough plan of action (POA). This is the first step to delivering a successful webinar. Define the webinar’s objectives and your target audience. Pick a topic and a presenter(s). Decide what the format style is going to be based on the objectives you are trying to accomplish – one speaker, interview style, moderated panel discussion or interactive. Define your webinar goals – webinars typically get a 30-40 percent attendance rate, so to determine how many registrants you need, you should think ahead to how many actual attendees you want. Make sure that you have a marketing team call or meeting the first week of planning to commit to a topic, content, timeline, and team roles. Send invites to each team member blocking off all key times and dates in the webinar pre-planning process. This way, all calls and meetings are locked in early enough in advance. During POA development, coming up with a webinar title is extremely important. Create a compelling message that is going to draw your target audience in and get them excited about registering for your webinar. Make the content relevant to your audience. Let them know what the key benefits are to attending the webinar and how it’s going to help them. Now that the POA is concrete, week three and four are all about email setup and promotion along with infrastructure setup. It is always best to create two different promotional emails so you can test which one performs best. However, if you only create one promotional email, that can work as well. You will need to create a registration landing page and thank you confirmation page to go along with the email. The HubSpot landing page below is a good example of a webinar registration page. You will also need to setup reminder emails within the webinar platform you choose to deliver the presentation. All of my clients either use GoToWebinar or WebEx. Both are excellent choices to delivering a great webinar experience to your target audience. Send out reminder emails two weeks in advance, then one week in advance, one day before and one hour before the day of the webinar. These reminders not only serve to remind registrants about the webinar’s date and time, but rebuild the value that you established with them on your registration landing page. During this stage of the planning process, take the time to create your post webinar emails – one for attendees and the other for no shows. The message will be slightly different depending on who attended vs. didn’t show up. Make sure to integrate your CRM and marketing automation software and set up any tracking codes, UTM strings, Bit.ly, or vanity URLs so that you can identify specifically what sources are driving registrations. Once integration and tracking are in place and tested, send out the first promotional email. Add the webinar event to your website as well. Social promotion should begin week five in the planning process and run all the way through to the day of the live webinar. It is very important that you get any partners, the speaker(s) and sales team involved in social promotion. Create a series of 20-30 social posts with unique verbiage that can be frequently promoted. Use hash tags relevant to your target audience and topic in Twitter, Facebook, and Google+. Don’t use hash tags in LinkedIn though. If you plan on hosting quarterly, monthly or weekly webinars within a specific topic, come up with a unique hash tag that can be used and promoted within your presentation, during and after the live event. Should there be more questions than can be answered during the Q&A session of your webinar, this hash tag can be promoted and used as a way for your audience to ask questions and for you to answer them in a timely manner after the webinar. This is also the time to consider advertising and promoting your webinar via social channels. 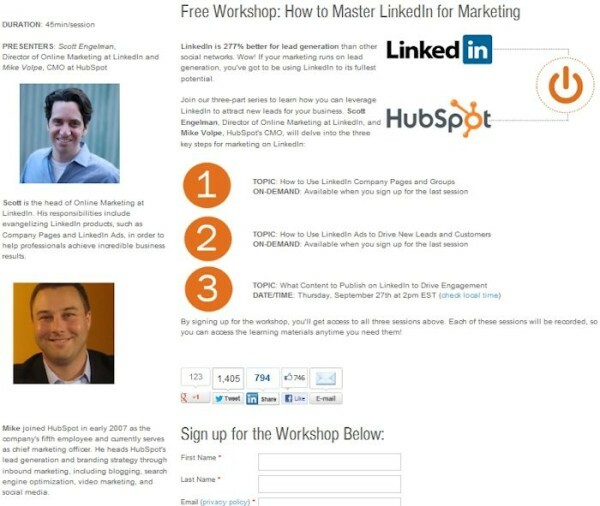 LinkedIn and Facebook sponsored ads are a great way to increase registrations and visibility to your target audience. Sponsored ads can be targeted towards specific companies, job titles, job functions, and job skill sets. Review social data daily. Are you hitting your target numbers? If not, make some slight revisions as necessary. A first dry run should take place week six. For the first dry run, review your presentation slides, perform a dry run with all speakers and moderators involved, identify poll questions and supporting content, narrow down webinar timing and your Q&A session. Have several Q&A questions ready to go just in case no one asks any questions during the webinar. This is highly unlikely to happen, but it’s always best to be prepared. A final dry run should take place the week of the webinar. Treat this final dry run as if it is the actual live webinar. Lock down your presentation, review the final details for the live webinar, and practice your poll questions and Q&A session. Have offline communication details in place (offline chat, IM or cell phone) should any issues arise. Record your dry runs so that you can watch and listen to them before the actual webinar. Test to make sure the recording is working properly and can be used to promote for on-demand viewing after the event. Phew…now that the webinar is over, it’s time to focus on the post webinar planning details. First, you must download the on-demand version of your webinar and convert it to your video player. As you are doing this, make sure your video player plays across all browsers and all devices. Second, an email should be sent out to attendees and no shows no later than 2 days after the webinar. As I mentioned previously, the messaging in these emails should be slightly different. For the attendees, thank them for attending the event and let them know of any upcoming webinars as well as provide a link to the on-demand version so they can view it again if they’d like. For the no shows, mention that you are sorry they couldn’t make it and that you missed them and then provide a link to the on-demand version so they can view at their leisure. Promote your on-demand webinar by adding it to your website. Update the landing page on your website to download and view the on-demand version. On our site, we have an on-demand webinar archive page dedicated to all of our on-demand webinars. Create several social posts for promotion as well. Score and prioritize your leads. It is important to keep in mind that not all leads are equal. The prospects attending your webinar are most likely in different stages of their evaluation process. Consider this when putting together the content in your lead nurturing emails. Execute a lead follow-up process with your sales department so that high-value leads can be contacted first. Look at metrics such as Q&A questions, time attended, any content downloaded and poll answers. These are excellent metrics to study when putting together lead scoring values so that sales can most effectively follow up on leads. Webinars can attract new prospects to your website, help move those you are already in touch with further down the sales funnel as well as increase current customer loyalty. Planning a successful webinar can elevate a company’s credibility and reinforce its position as an industry thought leader. So what are you waiting for…time to get started planning a successful company webinar!